Eek! One moment, you are talking to a group of friends and sharing a joke that leaves everyone rolling in laughter. When you open your mouth to laugh as well, suddenly everyone grimaces and steps back. You realize in horror that they are all stepping away because your breath is rancid. Nothing is worse than realizing that you have bad breath. The only thing worse is when you have bad breath that you cannot get rid of. In addition to being embarrassing, this symptom can make you afraid to go to social events or talk at work. While this is sometimes an indicator of an underlying medical issue, it may also be due to factors like oral hygiene or the foods you ate. If your breath smells like poop, your first goal is to figure to why so that you can solve the problem and have sweet-smelling breath again. Diabetes is an extremely common ailment in the United States. Sometimes, people with diabetes have breath that smells like poop. This starts because your body is not creating enough insulin. As a result, your body cannot metabolize glucose. Fatty acids try to do the job, but this causes symptoms like bad breath. If you have or think you could have diabetes and your breath starts to smell, go to your doctor to have your blood sugar levels checked out. One common cause is quite easy to remedy. Sometimes, conditions in your mouth lead to a foul-smelling odor. The most common cause is bad oral hygiene. If you forget to floss or brush your teeth, it can lead to bad breath. In addition, badly fitting dentures, cavities and gum disease can lead to bad breath. Drinking excessive amounts of alcohol or smoking cigarettes can give you bad breath. Some other things like garlic, onions, sinus problems, dry mouth, medication or vitamin supplements can also give your mouth a foul-smelling odor. If you wait to eat for too long or skip a meal entirely, your stomach acid begins to turn sour. Then, the scent escapes from your mouth. This can cause your breath to smell like poop. To prevent this problem from happening, drink plenty of water and make sure to eat small meals throughout the day. Dehydration is actually a very common ailment. You may not be drinking enough fluids, or you may be dehydrating yourself by consuming diuretics like sugar, caffeine and alcohol. When you are dehydrated, your mouth becomes dry and develops bad breath. The easiest way to fix this is to drink more water. If you cannot drink liquids immediately, a sugarless candy can help stimulate saliva in your mouth. If you are suffering from kidney failure, toxins in your body are excreted through your lungs. This actually causes your breath to smell like urine. If you think that this could be the cause, you need to go to your doctor right away to be checked out. When you have an awful upper respiratory infection, you already feel awful. Worse still, you can develop bad breath. Known as bronchitis, this infection causes your lungs to become irritated. When you cough, your bad breath is easily smelled. Luckily, the scent should go away once you heal from the infection. Like bronchitis, sinus infections can cause you to have bad breath. Mononucleosis or strep throat can do the same thing. Basically, bacteria is dripping down your nasal passages and into your throat. Drink a lot of water and wait for your infection to clear up. Stomach disorders like acid reflux, obstructed bowels, GERD or IBS can cause your breath to smell bad. These disorders can be diagnosed by your doctor by doing an endoscopy. Unfortunately, allergies are a common cause of bad breath. When you have allergies, you develop symptoms like watery eyes, runny nose or coughing. You can also end up developing a lung infection, sinus infection or sore throat. An antihistamine is typically used to treat the congestion. When you take an antihistamine, it dries your nasal passages and mouth. 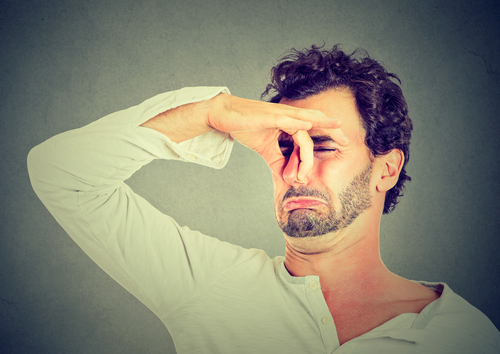 The lack of moisture causes your breath to smell like poop. Try drinking more fluid throughout the day to prevent this from happening. Liver failure can cause your breath to develop a fishy odor. If you think that this could be the cause, it is important that you go to the doctor to be diagnoses and professionally treated. Obviously, your first goal should be to figure out why your breath smells bad. The most effective way to treat bad breath that smells like poop is to treat the underling medical condition that is causing it. If this is not effective or you want something to do in the interim, there are a few options that you can do in the interim. Start by making sure to floss and brush your teeth twice a day. Avoid tobacco and alcohol because these will only make your breath worse. Avoid onions and garlic since they are known to cause bad breath. You can also go to your dentist to make sure that you do not have any dental problems causing it. Get any cavities or abscesses treated. Mint and parsley can help improve your breath’s scent. An antibacterial toothpaste and mouthwash can help reduce the bad scent. If nothing seems to help, make sure to go to your doctor to figure out if an underlying medical condition could be causing the problem.